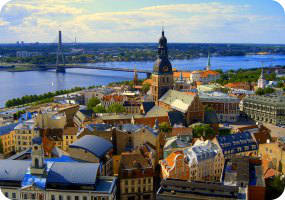 Book now the best shore excursions in Latvia. High quality and safety at the lowest prices. If your are looking for Shore Excursions Latvia, book now the best guided tours at lowest price with Ancora Tours. Since 2003 we offer you official guides in english, transportation and travel insurance, all included. The highest quality at the lowest rates. Nestled between Lithuania and Estonia, Latvia has a diverse culture and a varied landscape encompassing beaches, dense forests and many picturesque lakes. The cosmopolitan capital, Riga, is the place to go for wooden and art nouveau architecture and plenty of churches and museums. Its medieval Old Town is a UNESCO World Heritage Site.